Did you know about one in three Americans suffers from a variety of gut problems? On top of those who seek help for some form of gastrointestinal distress, there is even a higher percentage of the population who’s symptoms of gut dysfunction present within the skin, nutritional deficiencies, food sensitivities, frequent colds/infections, mood disorders, chronic fatigue, headaches, brain fog, and even autoimmune disorders. As the first line of defense for any of these concerns or conditions, addressing the health of one’s gut will often have a dramatic impact on one’s health. Whether you’ve been diagnosed with a pharmaceutically managed condition, written off as having IBS or fibromyalgia, or just know there is something “in the way” of your optimal level of health or performance, a great place to start is through addressing the cause and not just focusing on the symptoms with a Functional Medicine approach to gut health. At Wellness Doctor, we address the 5 R’s of Functional Medicine and several of the dietary principles encouraged through a whole food antiinflammatory diet. Dr. Kremer has even gone as far as creating his own 30 Day program that addresses these principles through clinical-grade nutraceuticals and a specific low-allergen, antiinflammatory diet. Did you know that nearly half of all visits to internists are for “functional bowel disorders,” such as reflux and irritable bowel syndrome? In fact, two of the top best-selling drugs in the United States are prescribed for gastrointestinal problems. Sadly, these top pharmaceuticals are meant to only “mask” the underlying problem and ultimately create more problems for most in the future. Click here for Dr. Kremer's article on Proton Pump Inhibitors. Many physicians use the word “functional” to describe problems related to the function of the gut (situations where the intestinal tract simply isn’t working properly), as opposed to “structural” disorders, which are something a gastroenterologist can see on an endoscopy or colonoscopy such as blockages, ulcers, hiatal hernias, villous atrophy (Celiac Disease), etc. and therefore are often considered more “real" and treatable… Functional gut disorders are equally real problems with very real causes and often end with serious consequences. Our G.I. 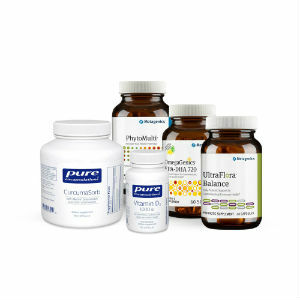 FIX Program is a simple comprehensive start to improved health by reducing inflammation, improving gut function, detoxification, and resetting your body’s metabolic components.